A white-tailed deer keeps its ears open while grazing in South Hero, Vt.
Hungry deer in the northeastern U. S. are likely changing the acoustics of their forests by eating up bushes, small trees and other leafy plants that normally would affect the transmission of natural sounds such as bird calls. "The deer are very, very over abundant," says Megan Gall, an ecologist at Vassar College who studies how the environment shapes animals' senses. "It's much lusher when there are fewer deer around, and so that's a big change in the structure of the environment." She got intrigued by the possibility that deer might affect the soundscape after talking with a couple of colleagues who were studying how browsing deer could transform a forest ecosystem by munching through the entire lower level of leafy plants. Gall already knew that sound travels differently through open fields than through the woods. She also had previously studied how human-generated noise can impact wildlife communication. To see how deer might change what other animals hear, she decided to do some experiments in a couple of forested areas that her colleagues had set up for their deer studies. One area was fenced off in a way that kept out the deer. The other area was marked off but left open so that deer could enter and graze. Gall and two students, Timothy Boycott and Jingyi Gao, set up audio equipment around these areas. They broadcast different sounds and checked to see how those sounds changed after traveling through each environment. Rather than using specific bird calls, the researchers played a series of pure tones, white noise and trills. "All of these things are found in different kinds of animal sounds," Gall says. "We wanted to have sort of a very broad palette of sounds to look at." They checked sounds that they sent through the lowest level of the forest, in the middle-level of the forest and at angles going from the ground upward. The results, published in the journal PLOS One, show that the overall loudness didn't change much — which didn't really surprise the researchers, since they were measuring only over short distances of 36 feet or less. But the structure of a sound changed a lot when it was propagated through a lush, green understory that the deer hadn't snacked on. "When deer were browsing, we actually found that the sound was clearer," Gall says, "and that's probably because there was less vegetation in the way. You don't have as many sounds bouncing off of leaves and sticks and things like that. 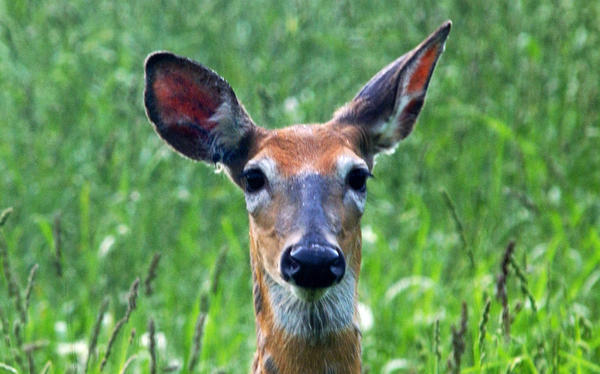 When deer are browsing, the sound actually has higher fidelity as it moves through environment." Bernard Lohr, a biologist at the University of Maryland, Baltimore County, who did not work on the study, says this is an intriguing finding. "In one sense, I kind of think, why hadn't anyone thought of doing this before?" he says, noting that human activity has resulted in an explosive growth in deer populations. "That should have obvious implications for the acoustics of the habitat." Lohr says you'd expect the resident birds to adapt their songs. "Something like this should change the acoustic structure of the signals, especially learned signals which evolve culturally," he says, "and so that can happen quite quickly." Birds could start using higher frequencies that don't normally transmit well in forests, Lohr says, adding, "Some of that acoustic niche may be opened up to them." Birds' communications could change in other ways, as well. Gall says that many times, birds aim their message toward another specific individual and would rather not be overheard by rivals, predators or other eavesdroppers. "If you're a very territorial species, like a cardinal for instance, having your signal propagate in a way that's more efficient could be bad for you," Gall says, "because you might end up in a lot more altercations." On the other hand, she says, social birds such as chickadees could benefit from more clarity as they flock together in the winter and alert each other to dangers. Lohr thinks researchers could look to see whether bird songs have a different structure in areas that haven't been cleared out by deer. "The challenge is to find places that have not been browsed," he says, "to see if any of these changes have already occurred. Deer are so pervasive. You'd really have to look hard to find areas that have not been browsed." Deer in the northeastern United States have been munching through forests, eating up bushes and small trees - no doubt looking for BJ Leiderman, who writes our theme music. The overpopulation of deer has changed the way that forests look. And as NPR's Nell Greenfieldboyce reports, the deer have also changed the way that forests sound. NELL GREENFIELDBOYCE, BYLINE: Megan Gall is an ecologist at Vassar College. She's studied how birds react to human-created noise from nearby cars or overhead planes. After talking with a couple of colleagues who study how deer can consume the entire understory of a forest, she started wondering how that might change the soundscape. MEGAN GALL: So if you think about going into a gymnasium, there's lots of really hard surfaces. And sound will bounce all around. And that'll change how it hits your ear compared to going outside after a fresh snow; it'll be very quiet. And the same thing happens in forests versus other kinds of habitats. GREENFIELDBOYCE: Her colleagues already had two experimental areas set up inside a forest. One area was fenced off. The other was marked off but left open so that deer could enter and gobble up plants. Gall's team set up audio equipment in each place to test how the different environments affected the transmission of some basic sounds. GALL: All of these things are found in different kinds of animal sounds. And so we wanted to have sort of a very broad palette of sounds to look at. GALL: One was just pure tone. So pure tones are like single notes. GALL: We're also looking at white noise, which covers a large range of frequency. And then we had trills. So trills are things you'll hear in a lot of bird songs. GREENFIELDBOYCE: What they found is that sounds changed less when they travelled through areas grazed by deer. GALL: When deer were browsing, we actually found that the sound was clearer. And that's probably because there was less vegetation in the way. And so you don't have as many sounds bouncing off of leaves and sticks and things like that. GREENFIELDBOYCE: The results are published in a journal called PLOS One. And they raise questions about how this is affecting birds as they sing songs to defend territories or find mates. Bernie Lohr is a bioacoustics researcher at the University of Maryland, Baltimore County. He says birds are known to change their songs in response to ambient noise near, say, airports. The deer's activity might have a similar effect. BERNIE LOHR: Something like this should change the acoustic structure of the signals, especially learned signals, which evolve culturally. And so that can happen quite quickly. GREENFIELDBOYCE: He says forest birds might start using higher frequencies that are more typical of birds living in open habitats, like grassy fields. Nell Greenfieldboyce, NPR News. (SOUNDBITE OF JOAKIM KARUD'S "CLASSIC") Transcript provided by NPR, Copyright NPR.